Sometimes, when I’m bad, I’m really bad. 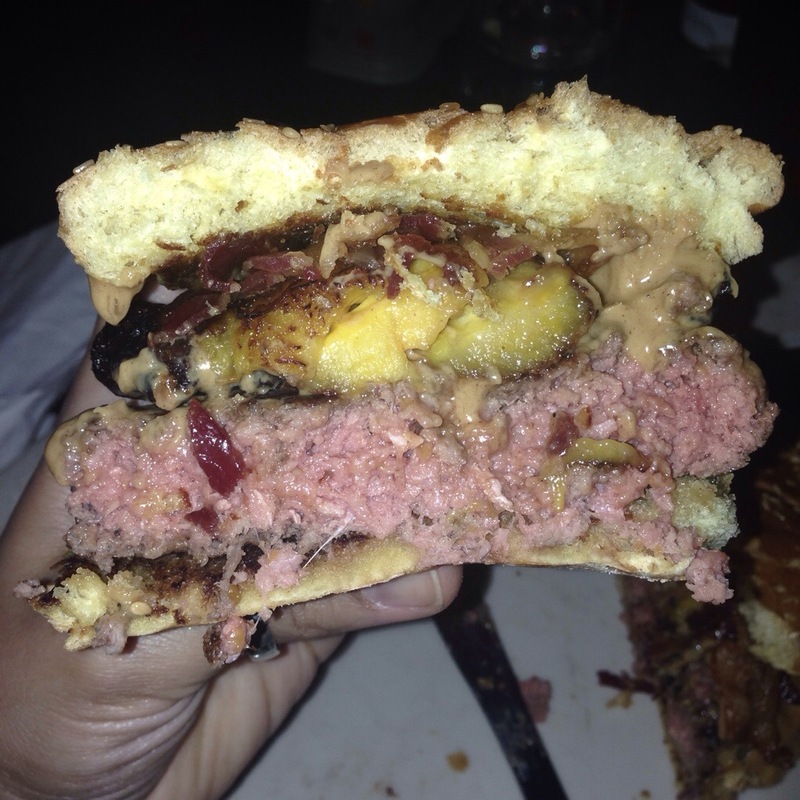 And when a trusted source recommended I try The Fat Elvis burger at Atlanta’s Vortex Bar and Grill— a towering behemoth of a burger topped with peanut butter, bacon and fried bananas— I knew it was time to throw caution to the wind and be very freakin’ bad. The Fat Elvis, ever so appropriately named after the King in his later years when he was known to wolf down peanut butter, banana and bacon sandwiches, is as serious as the heart attack it’ll cause you if you eat too many in one lifetime. It’s a massive beast, definitely not for the faint of heart and certainly not for anyone with a delicate stomach. My sister seemed mildly disgusted by the idea and and when it showed up at our table, on a plate filled with tater tots (Cause what, was I supposed to get a salad to go with it?) she just looked appalled. 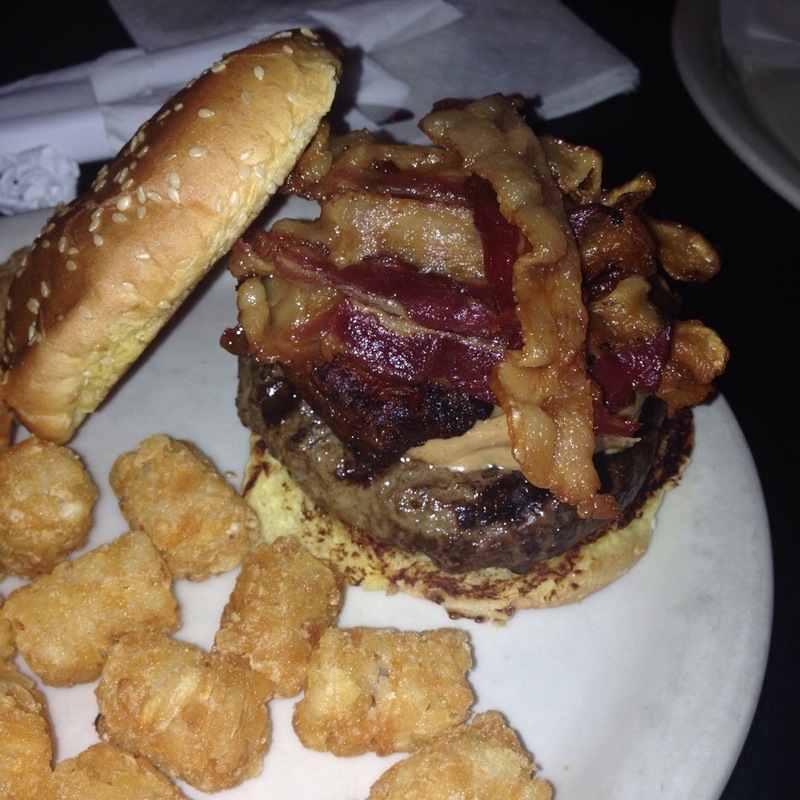 You have to bring your A game when ordering this bad boy. Sandwiched between two doughy, soft buns was a big ol’ hunk, a hunk of juicy beef (See what I did there?) cooked to just the most perfect tender pinkness, smeared thick with a melty, creamy peanut butter, deliciously soft, sweet fried bananas, and everyone’s favorite: thick, wavy, glistening strips of bacon. Clearly, there was no neat, civilized way to eat this thing. It oozed peanut butter out one end and all sorts of juices out the other. It was messy and obscene, a crazy mix of flavors and textures, and absolutely delicious in all the worst ways. Will the Fat Elvis be filed under sensible meals or healthy living options? Nope, not ever. But like so many things that are bad for you, it was damn good. Side note: in case you were wondering, my sister ordered a burger topped with a heap of blue cheese spread, which isn’t something I’m totally crazy about so no, there are no pictures. My attention was completely devoted to The Fat Elvis. Nothing else.